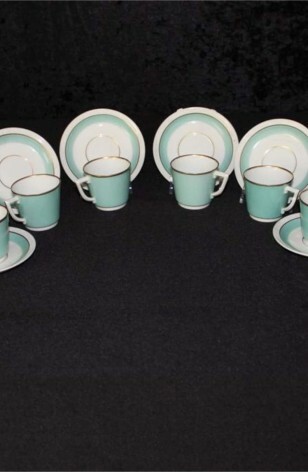 Royal Copenhagen Porcelain China Tea Set - Ermeulund Pattern #790 - Made in Denmark in 1949 - Total of (14) Pieces. A beautiful Royal Copenhagen Ermeulund Pattern #790 that is an attractive White China, with Aqua Band on the Inside Lip, Surrounded by 22kt Gold Gilt Stripe. Cups are Aqua exterior, with Inside of White, having a 22kt Gold Rim and Foot. This is a lovely Mid-Century Modern Pattern that is still in demand on today's market. 6 - Saucers - 4 1/2"